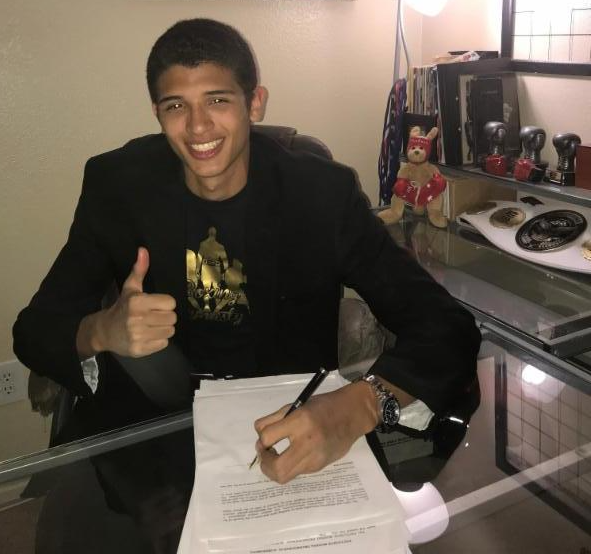 Sampson Lewkowicz of Sampson Boxing proudly announces the signing of undefeated super welterweight prospect Sebastian ‘The Towering Inferno’ Fundora to a promotional contract. The 6′ 7″, 20-year-old southpaw Fundora, from Coachella, California, is the tallest fighter in his division in the world. Lewkowicz was, at first, reluctant to sign a virtually unknown commodity in Fundora, whose tall statue and low weight make him look deceptively emaciated. So, always having been a great eye for talent, Lewkowicz put the young fighter in some tough match-ups and was very impressed by the results. In September of last year, Fundora took on then undefeated Victor Toney and dominated him over six rounds. Looking to evaluate him further, Lewkowicz then put Fundora in a couple tough tests in South America and he won both by near shutout. Fundora has worked as a sparring partner for the world’s youngest super middleweight world champion in history, David Benavidez… also a Sampson Boxing fighter. It was members of Benavidez’ camp who initially directed Lewkowicz to the fighter. “I now have boxing’s youngest super middleweight champion in history and the tallest junior middleweight in history,” said a proud Lewkowicz of his promotional stable.